Consider rain chains as a decorative alternative to drains. You can listen to the melody of flowing streams only during the rain, but this it is often enough to relax. Additionally, this is an opportunity to save on drains and replace them with an original, decorative element that simultaneously collects water from the roof and demonstrates the beauty of its movement to everyone nearby. Copper rain chains are open-type structures, in which water moves in a cascade, flowing from one tank to another. Usually, containers are holed bottom decorative pots in the shape of a cone, placed funnel up. With the addition of some light rain, the jets go into the hole from the bottom; during a heavy rain flow, the jets go come from all edges of the pot. Between themselves, the containers are fastened with a decorative chain, which is what has termed the whole structure as “kusari doi”, which in Japanese means “rain chains”. The top of the structure is fixed on the eaves, right below the water flow, and the chain is securely fixed to the ground with an anchor. The goods are tied and lowered to the bottom of the water intake, so that during strong gusts of wind the chain does not swing and avoids hitting the building. In the design of the rain chain, an important element is the catchment basin, to which the edge of the chain is fixed to protect against wind. For what kind of climate does such a structure fit? With all its originality, rain chains raise many questions. The most frequent is how appropriate they are in a cold climate with harsh winters, because if snow falls there, then after the slightest thaw, it can turn into a block of ice. Is this enough to break off the eaves? In fact, everything depends on the choice of the shape of the rain chain. In Japan, where the climate is mild, many identical containers are most often used in the construction; however, in northern countries, the shape is somewhat different. Rain chains can be hung in any climate, so long as you choose a design that takes into account the severity of winter. To prevent a lot of ice from growing on the rain chain in winter, you can choose a model consisting of large links that don’t require the use of tanks. You can also create a masterpiece by yourself and many gardeners do it very well. 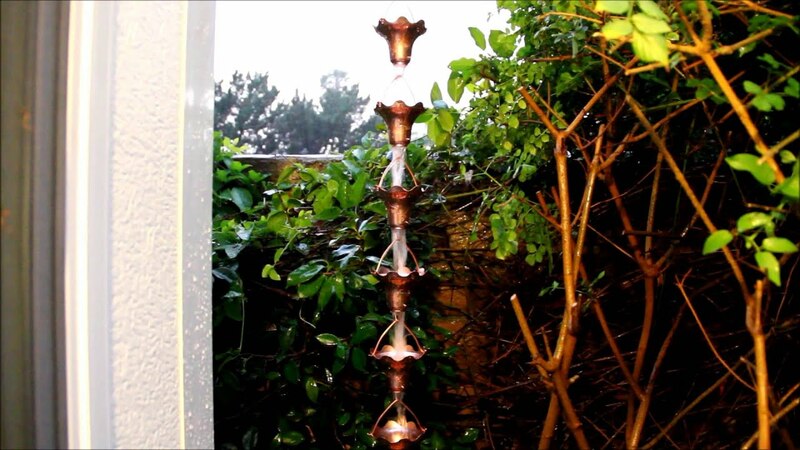 Consider the most interesting forms of rain chains that you can make yourself. The most popular model of the rain chain is the design of metal copper pots, as it looks organic in any landscape. Design such as those of teapots or children’s watering cans can be crafted. From old teapots or ordinary plastic watering cans, you can create an original chain in either country style or any other variations. The basis on which the whole structure will be supported should be a decorative chain. Fortunately, it is easy to find in any flower shop. After acquiring a flower chain, you can hang kettles or watering cans from it, thereby ensuring that the nozzles fall just above the hole and collect water in the downstream tank. Continue reading "Rain Chains as a Decorative Alternative to Drains"
If you are preparing to remodel your existing kitchen, you know that it is stressful and time consuming as well as expensive. However, there are steps that you can take to reduce all of these and actually enjoy the process of changing your room. Prices can be reduced enough so that you can splurge on other items that you would not typically change. Such as, upgrading the appliances you put in the new kitchen. Take your time in finishing the renovation and you will find that it is not only a fun and exciting time but does not have to bust your budget. The first thing you should decide is what you want to change and what you will change it into. If you are removing walls inside the room, you need to check that it is not a supporting wall for the structure of your house. Once you have checked into that, you can plan on removing the wall and what you will replace it with. You may decide not to remove the entire wall but only half of it and replace it with an island where you can prepare your meals. Moving plumbing fixtures is another concern you should have and having a professional look at what the changes to this will entail is essential. After you have made these structural checks, you can then begin to put together your plan for how you want your new kitchen to look. Contact a kitchen remodeling company louisville ky. is a good idea in order to put your plan into action. While some of the remodel can be done by the homeowner, some of the aspects of it will require the services of a professional company. Kitchen remodelers are experienced in doing any type of renovation work and they will get the job done much faster than you can do it yourself. Even though you will often pay more for the work this way, you will also get the design you are seeking in a short period of time. 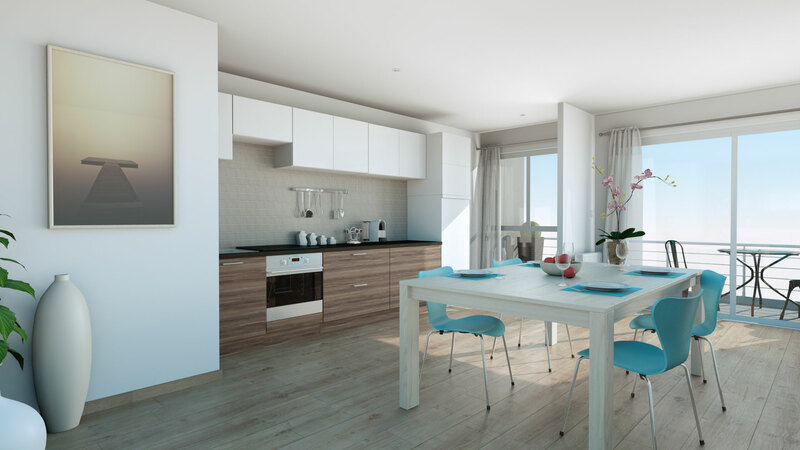 They can typically remodel a kitchen within a couple of weeks depending on items you may have to order. Custom cabinets will take a while to receive and this will delay the work. Contractors will also give you a guarantee of their workmanship which means if there are any problems after the job is complete, they will come back and make repairs as necessary. They will also make recommendations on items that you are unsure of and will work to get it to fit into your design. If you are the type of homeowner who likes to be hands on, you can indicate this to your contractor and they will often work with you to include you in the work that is done. The most exciting part of any remodel job is after the work has been completed and you get to decorate the new room. Choose new pieces that fit into the style of your new kitchen. Continue reading "Remodeling Your Kitchen Can Be Fun"
Use of an outdoor space by a homeowner gives the residents access to fresh air and an opportunity to experience many pleasant activities. Residents can utilize an outdoor space for many purposes: grilling, playing games, watching sports, entertaining, etc. The deck is a great outdoor space for those types of activities. Timber decking Northern Beaches can build a great outdoor space for your family to enjoy for years to come. 1) Spotted Gum is a premium Australian hardwood that grows along the eastern coast of the continent. It goes by other names: lemon-scented gum, eucalyptus maculate, eucalyptus henryi, eucalyptus citriodora, spotted irongum, corymbia henryi and corymbia citriodora. The decking wood could be anywhere from pale grey-brown to a soft cream to as dark as a rich chocolate brown. It’s characterized by the wavy grain with a fiddle-back effect. 2) Tallowwood is an Australian hardwood that can be found in the wet sclerophyll forests of the coastal regions in New South Wales, Maryborough and Fraser Island, Queensland. Tallowwood decking ranges from yellowish-brown to a pale olive green. 3) Blackbutt is large tree native to Southeastern Australia. One of Australia’s most popular hardwoods, it makes a blonde-colored decking. 4) Treated Pine is uniquely identifiable by its gum veins, spirals, insect trails and burls. Because to the treatment the wood receives it can withstand the effects of weather, insect infestations and rotting, extending its life. 5) Merbau this red-brown decking is class 1 timber. 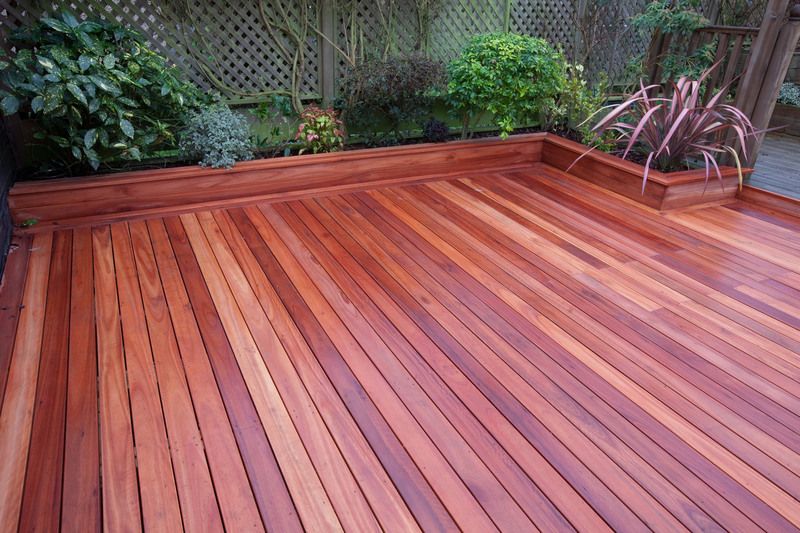 6) Ironbark is very durable and the decking ranges in color from the reds to the browns. 7) Modwood is a composite wood product that uses the sawdust from trees mixed with reclaimed materials to make an environmentally sound product that doesn’t need staining, never splinters and doesn’t rot. 8) Northern Box creates a decking wood called Palawan. It is very hard and very durable. 9) White Stringybark is an Australian Class 2 hardwood with a life expectancy of 40 years. The wood is a light brown to a pale pink in color. 10) Forest Red Gum is a dense and durable hardwood that is light to dark red in color. Each of these beautiful wood products can be used to make a well-constructed, durable deck for your Australian home. This wood offers a lot of versatility and does not limit the style of decking you can choose. Multi-level decking, decking suspended over pools, decking separate from the house and decking with extra tall supports can all be successfully constructed using these woods. Hardwood timber can be used to construct a durable outdoor structure such as a deck and with proper care, it can last for an extended time, up to 60 or more years. To clean a hardwood deck, us simple soap, and water. Never pressure wash a hardwood deck. To remove an aged finish, always use a commercial cleaner designed for hardwoods. Always use a two-part cleaner and brightener designed for hardwood. The color should return to its original look after applying the brightener. Use stains designed for the decking and enjoy your deck for the rest of your life. Continue reading "Understanding Solid Wood Types for Decking"
A termite is a wood demolishing bug that’s also known as a white ant. There are three distinctive breeds of termites, such as damp timber dehydrated timber, and hidden bugs. Damp wood insects particularly reside in atmospheres that are massively wooded, and dry wood insects live in dehydrated wood and not many have been spotted in the U.S. Hidden bugs are critically disastrous and require moist surroundings and hibernates within soil. These insects have contributed to billions of dollars in deterioration destruction yearly; however, there is a way to rid and eliminate them. How Can Pest Experts Help with Infestations? With so many pest experts, one should certainly research to find an effective solution for this specific issue. Termite control Muncie IN, specializes in all categories of bug contamination’s. They have the equipment and a huge team of experts that can examine your pest concern promptly and effectively. They understand the inconvenience and distress contamination’s can cause and work to examine, capture and eliminate pest concerns instantly. They provide a reliable and secure service for homeowners and work to get the job done right effectively. Termites particularly appear in the spring and are commonly spotted as a bevy of flying bugs. If you feel your home may have become a nest haven for insects, here are some red flags of contamination to look for. Soft wood is a perfect sign of bug contamination that you should look into. Another red flag is the appearance of mud tubing on the outside and inside of your home or near the infrastructure. Darkened or erupted wood textures may also be a red flag of a contamination concerns. For any reason you notice the red flags mentioned above, it may be wise to contact a pest expert to come examine your home. Many homeowners make fatal mistakes by trying to take these concerns into their hands, it is not recommended to do this on your own. Pest experts are prepared and possess the adequate elements and tools to tackle and eliminate such infestations utilizing a safe and secure strategy. Nonetheless, it is wise to initiate specific procedures to assist in preventing bug contamination within your home. You can eliminate the necessities that these bugs have the need for, such as damp surroundings that subterranean love. Ensure all exterior spouts are turned off and sealed and there are no drips, this will phase out the dampness they love to reside in. Another good tip is check to see if your rainstorm run offs are properly closed tight. This step can also avoid dampness that may trigger towards the infrastructure of your home. Moreover, if you are not a specialist, it may be complex to clarify if the bugs have been eliminated permanently. The experts can insure the contamination is permanently eliminated by terminating the insects. This may be the best way to insure this concern is adequately eliminated. Continue reading "What to Do in Case of a Termite Infestation"